You are here: Home / Beginners / Why Hike Lightweight? My son may be laughing in this 1999 picture, but his monster pack is no joke. Over eight days that 55 pound pack took its toll on his body, his spirit & ultimately his enjoyment of the trip. Tired, cross people make bad decisions, sometimes with serious consequences. How about 24 pound pack for a one week trip? A 15 pound pack for a weekend trip? At these pack weights, backpacking feels more like day hiking. It’s hard to describe how freeing this is until you experience it. The trail miles melt away. Without the misery of a heavy pack you can actually appreciate the beauty of the land you’re hiking through. You get into camp early, with plenty of time and energy to do almost anything. What are Ultralight and Lightweight Backpacking? A personal history of going from a 55 pound to 15 pound pack. 55 pounds to 15 pounds and just as safe: Colin’s pack 40 pounds lighter to do a longer and more ambitious trip. Even so he’s warmer, safer and more comfortable than in 1999. This trip was actually fun! YES! An ultralight backpacker carries all of the same safety items that any hiker would take – clothing, sleep system (e.g. sleeping bag), shelter, first aid kit, water treatment, etc. Arguably this is a better thought out and assembled set of gear that will be safer, warmer and more comfortable than an ill considered set of conventional/heavy backpacking gear. 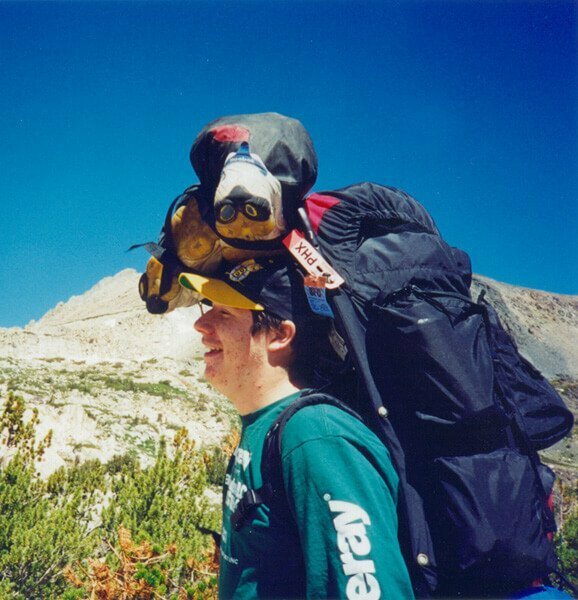 Inexperience and poor judgment of hikers cause most problems when backpacking – not the equipment. This can happen to someone with a pack fully laden with all manner of equipment just as easily at it can to an ultralight hiker with a stripped down load. Solid backpacking technique, familiarity with your equipment, sound safety practices, and above all good judgment, count a lot more for your well being on the trail, than the type and quantity of equipment you bring. That said, most of what the average backpacker takes is either too heavy; or unnecessary, adding little to their safety. With a little bit of thought, selecting lighter equipment, and leaving stuff you don’t absolutely need at home, you can carry enough to keep you warm, dry and safe for one-half to one-third the weight of what the average hiker carries. A silnylon (thin but strong fabric) tarp doesn’t provide the easy setup and bombproof rain and wind protection of a free standing tent. But in summertime in the Sierras where the normal weather pattern is for short afternoon thunderstorms, if any at all, do you really need the 5 to 7 pound tent? With proper care and pitching, the 0.5 to 1 pound silnylon tarp will keep you dry and sufficiently sheltered from the wind (I weathered some horrific Sierra storms and even a blizzard under a tarp without any problems). And it’s a lot airier and less claustrophobic under a tarp. If tarps aren’t your thing, there are complete two person ultralight tents and shelters for around 2 to 3 pounds (Links to: TarpTent or Six Moon Designs.) For more discussion of lightweight equipment see my Gear List Page. Lightweight backpackers fall in the range of a 10-20 pound base pack weight. Again, these numbers are completely arbitrary. There is nothing “wrong” with a BPW over 20 pounds. The goal is the find the least pack weight that meets your personal needs and goals. Make intelligent decisions of what you do and don’t want—rather than blindly buying heavy gear when you may not need it. * Base Pack Weight (BPW) includes your pack and all necessary equipment for your hike; but excludes food, water, and fuel. It also does not include stuff like cameras, binoculars, books, etc. or the clothing that you wear hiking. If you include your clothes and all equipment you carry but not food, fuel or water, the term is Full Skin Out Base Weight (FSO-BW). 3 season trips (Spring, Summer and Fall) for much of the lower 48. Usually camping below tree line. Might be a bit iffy at some windy, exposed, high altitude camp sites, although many are alble to this. And there is always the option to move to a lower and/or less exposed location. The short answer is: for $500 to $1,000 you can put together a great set of ultralight equipment if you are careful with your purchases. But be forewarned this is addictive stuff. Many who started out to spend a little end up spending a lot. Watch that credit card and beware the titanium tent pegs! Here’s some great Cheap Lightweight Backpacking Gear. Keep checking back as I add items to this list. The equipment for my 2001 summer ultralight gear list cost me under $700. But ultralight backpacking doesn’t have to be this expensive. I have put together a basic ultralight gear list for $250. Some of your current clothes and/or backpacking equipment may do just fine for ultralight backpacking (e.g your present pair of running shoes). Less is more: leaving unnecessary gear at home will save a ton of weight and cost nothing. Stores like K-Mart and Target have a surprising amount of inexpensive stuff that will work for ultralight backpacking, e.g. $20 fleece garments. You can purchase a great pair of $40 carbon fiber trekking poles at Costco. If you watch for closeouts from conventional retailers (e.g. REI, Campmor, EMS, etc.) and/or super deals from discount retailers like Sierra Trading Post you can get some great deals. https://i2.wp.com/www.adventurealan.com/wp-content/uploads/2015/09/c_shoes_big.jpg?fit=578%2C600 600 578 Alan Dixon http://www.adventurealan.com/wp-content/uploads/2018/03/adventure-alan-lightweight-backpacking-hiking.png Alan Dixon2015-09-09 19:29:362016-10-07 17:40:59Why Hike Lightweight? Thanks for all the info! I am putting together a lightweight pack and have a 35 liter osprey backpack. Do you think it’s too much of a stretch to fit everything in that size of a bag? Otherwise, do you have any suggestions that might help it fit? Depends Dan but probably borderline. As a guess, 35 L should work if you have fairly complete kit of compact gear–down sleeping bag, down jacket, a ground pad that compacts down tightly (e.g. NeoAir), a compact shelter (e.g. tarp, tarptent, or a pyramid-tarp like the Solomid), and no more than 3-4 days food. Any deviation from that and I think you’ll be struggling to to fit in the 35L pack. I find a pack in the 40-50 L range far more useful much of the time. Take a look at the Recommended Lightweight Backpacks page. Consider the ~50L HMG 2400 pack, or the MLD 47L Prophet or 57L exodus. Good Qs Mud Walker. 1) when using a tarp always get a large one. I use a 2-person tarp even when solo-backpacking. This gives you a huge sheltered area if your sleeping bag is in the middle of the tarp coverage. 2) where you camp matters. With either a tent or a tarp you need to pitch it in a place that water won’t collect. Tarps are best used (actually tents too) in an area sheltered from wind-drive precip. This greatly mitigates wind-blown precip from coming in under the tarp edges. 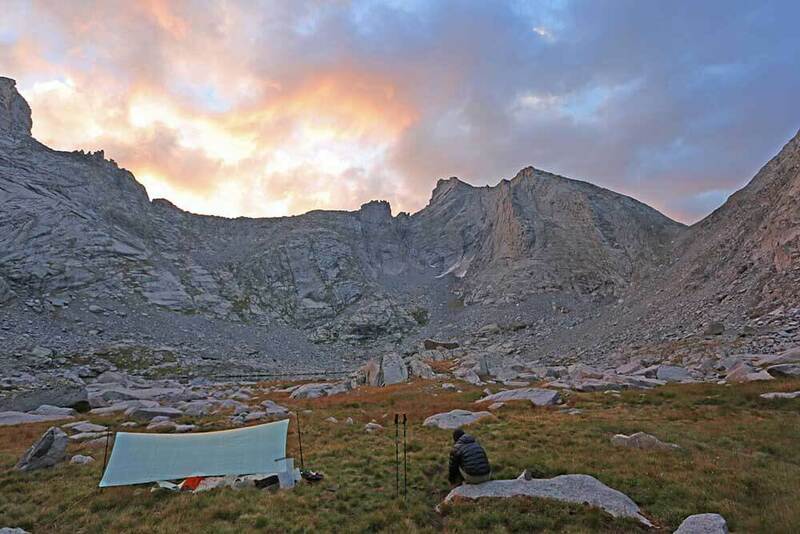 3) even in the wide open in a raging T-storm in the Wind River Range at over 10,000 ft I have been successful in staying almost entirely dry with two people under a 2 person tarp like in this photo. See Wind River High Route Trip Guide for more photos on using tarp. I followed a similar pattern. I started with heavier equipment 6 to 8 years ago. I did a lot of research online to find lighter items. You do have to spend higher prices for less weight. There isn’t a way around it. My base weight is now 19 lbs and I am good with that. I don’t agree, or rather, I just agree to some extent. Of course, REPLACING existing equipment with new, light gear will cost money, because keeping the old stuff cost nothing, while buying something new means spending $$$. Buying a new, complete equipment from scratch will, as long as one aim for around 8-15 pound BW, probably be cheaper than a traditional equipment, and often significantly soo.